The Bright Autumn Festival Bush Dance is on again! 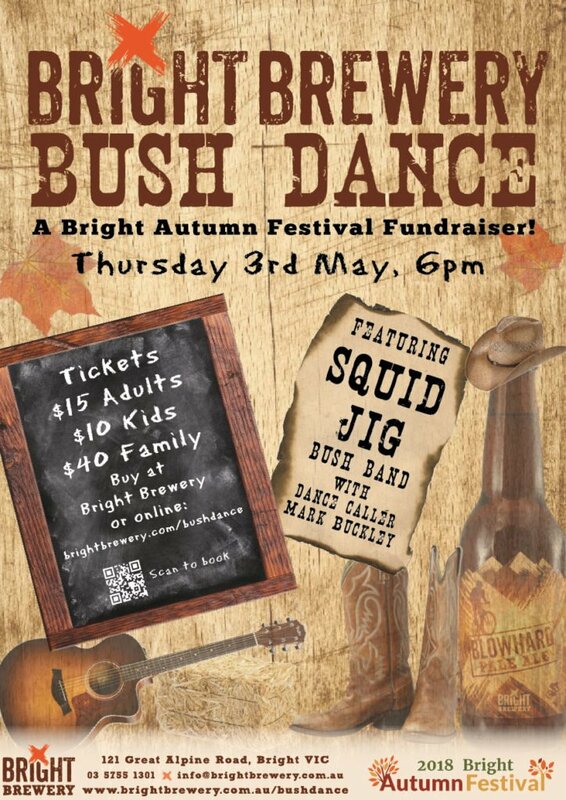 Round up your gang, grab your partner and swing on into Bright Brewery for a colourful night of bush dancing, featuring local bush band Squid Jig, which will raise money to support the future of the Bright Autumn Festival. Come join the fun! To be held on Thursday 3rd May 2018, from 6pm, this special event is a community fundraiser that will help showcase the spectacular Autumn season in beautiful Bright. All ages welcome! Yes, our normal dinner service will be in operation. Can I book a group table for the event? This is an outdoors event with plenty of large tables available at the event. Inside Bright Brewery’s bar – our normal booking policy applies. Does the event include allocated seating? No, there’s no allocated seating for the event. Your ticket is just for entry to the event, a cover charge for a night of bush dancing fun, and to raise money for the Bright Autumn Festival. There will be plenty of seats and space for everyone to move freely and enjoy a casual event. If you can come into Bright Brewery 3 or 4 days after purchasing tickets, we can arrange to have your tickets printed here, which you can come and collect from the bar. You will need to bring your printed tickets on the night. Yes, you can book as many tickets as you want in a single transaction, and you will receive that number of tickets via email (under the one name). Please note that each person in your group will need to have their own ticket with them when they arrive at the event (because we will only have the name of the person who made the booking).